With five month, 0% interest financing through Amazon in addition to an offer from Chase that would net me an additional 12% back by redeeming just a single Ultimate Rewards point, I decided to pull the trigger on something I’ve been needing for years. A new laptop. I’ll get this out of the way now, I’ve fallen in love with the Matebook. Full disclosure: My last laptop was an early 2008 Macbook. It was the early plastic model (an aluminum, higher spec refresh was introduced halfway through the year) and in addition to being downright hideous, would struggle to match the computing power of a bass guitar. At $1100 (Amazon price at the time of purchase) for the top-spec version it’s not exactly cheap, but it comes in significantly less pricey than similarly spec’d competitors. Especially with the discrete graphics card, which I’m happy to say I’ve already taken advantage of! Another way to look at it... Huawei’s Matebook is the top-of-the-line fully loaded Hyundai in a sea of black lease-special 3 series’. 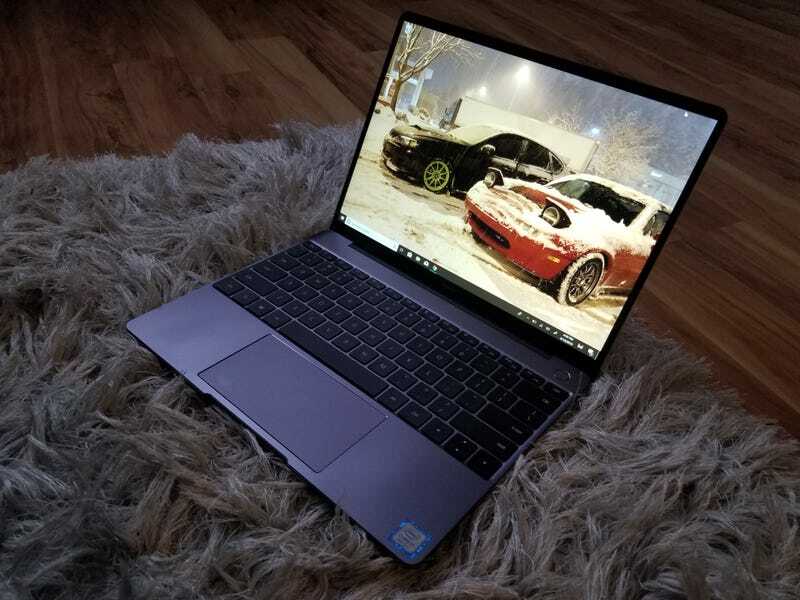 The MateBook 13 is quite impressive, especially when you consider that it offers more specs for your buck than virtually anything else on the market. It has outstanding performance, an excellent display, a fantastic keyboard and trackpad, and surprisingly compact dimensions. ﻿Huawei has created yet another highly-desirable laptop that packs some serious performance. The MateBook 13 is chock full of premium hardware, including that excellent i7 processor, Western Digital SSD, Intel AC-9560 Wi-Fi card, outstanding touch display, and a very good typing experience. for 2019, Huawei made a new mainstream 13-inch laptop meant to take down the recently revamped MacBook Air, and aside from one shortcoming, the MateBook 13 outclasses its biggest competitor in nearly every way. I bought this to be a multi-purpose laptop that could be brought practically everywhere. So far, it’s handled everything I’ve thrown at it without missing a beat. While I would have loved to see more ports (you’ve got 2 USB type-C and a headphone jack) they at least include a free dock, which is more than Apple does with the similarly spartan Macbook Air. There’s a free Windows 365 subscription included as well that I’m on the fence about using, as I’ve come to really love Google’s equivalents. Fingerprint sensor is incredible. beats any of the flagship phones I’ve used, and all of the laptops as well. It’s so fast! While petite in dimension, this thing is surprisingly heavy. I like that. Effortless connections with my phone. Mobile hotspot, bluetooth, Wi-fi, Samsung’s proprietary transfer standard.... every possible way to send data from one to another has been incredibly simple to initiate, with a solid connection. Trying to get modern Apple computers to play nicely with Android devices has been a massive headache for me so it’s been great to see that that isn’t necessarily the norm. The screen tilts back further than most laptops, which is great for those of us with tall torsos, or less-than-ideal workplaces. Okay, any questions? ask away.